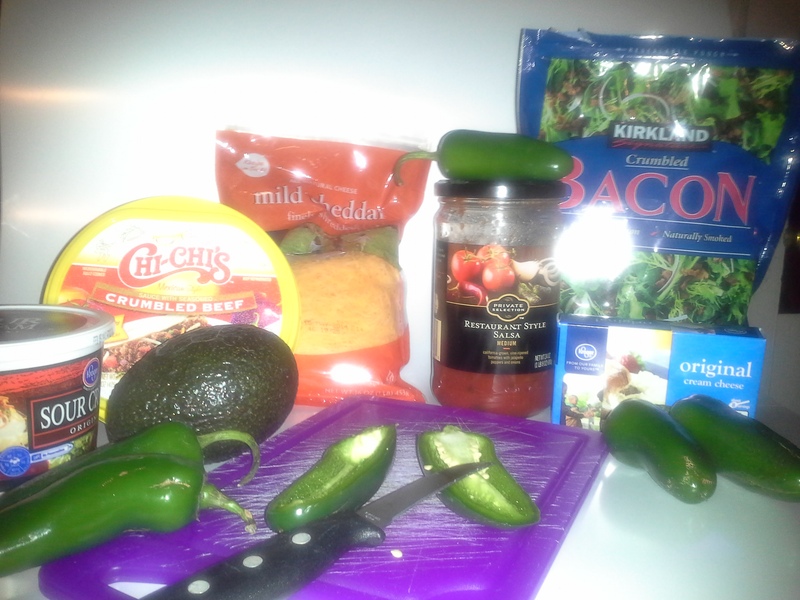 Just in time for the Super Bowl, here are two Jalapeno Popper recipes that make great snack food/appetizers. These are the kind that most people are familiar with. 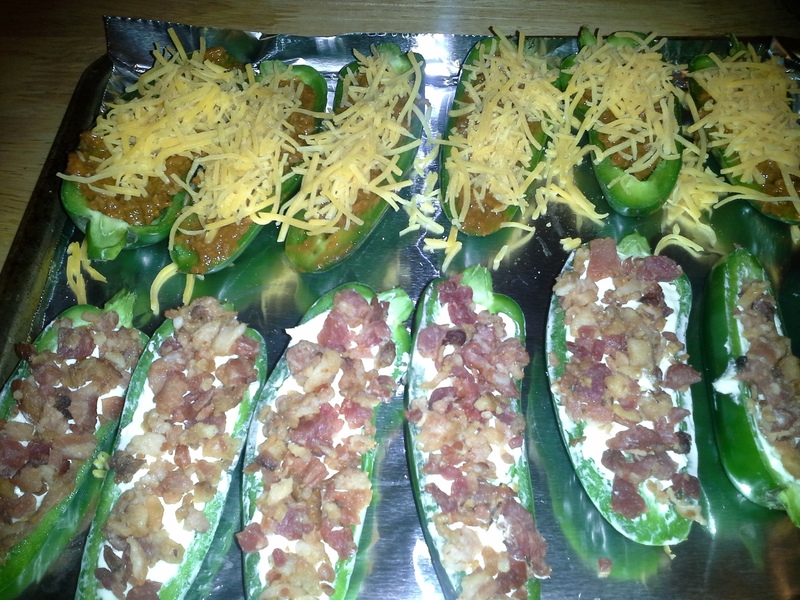 But I take a shortcut that’s quicker and less messy than wrapping the stuffed peppers in bacon. Preheat oven to 400–425°F (toaster oven: 450°F) and line a baking sheet with foil. Wash and dry jalapenos. Cut lengthwise in half, retaining the stem end, and remove seeds and membranes. If you feel the need to rinse them again, be sure to dry them well before continuing. Stuff each half with up to 1 tablespoon cream cheese (depending on how much you like cream cheese, you can fill it to the “rim” so that it’s smooth across the top, or you can leave a slight well down the center). 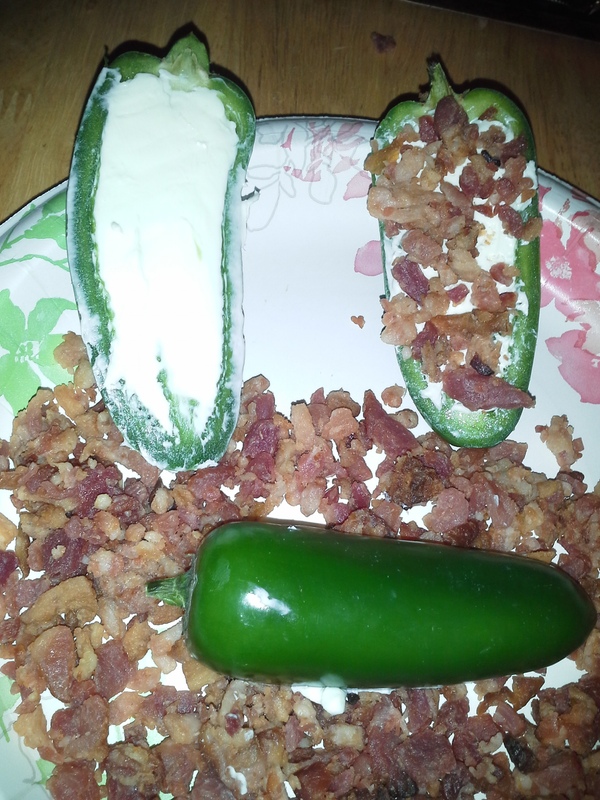 Press stuffed pepper, cream-cheese side down, into bacon bits. Knock off loose bits and press remaining bacon into the cream cheese. Arrange poppers in a single layer on baking sheet. Bake 25-45 minutes—until bacon is sizzling crisp and jalapenos are softening (the skin will appear wrinkled) but not mushy. Serve hot or cold. This was an experiment and, much to my delight, turned out pretty well. Wash and dry jalapenos. Cut lengthwise in half, retaining the stem end, and remove seeds and membranes. If you feel the need to rinse them again, be sure to dry them well before continuing. Fill each pepper with taco meat, about 1 to 1.5 teaspoons, depending on how much will fit. Sprinkle with a pinch of shredded cheese of your choice (Cheddar, Monterey Jack, Colby-Jack, Pepper Jack, etc.). *** Arrange poppers in a single layer on baking sheet. 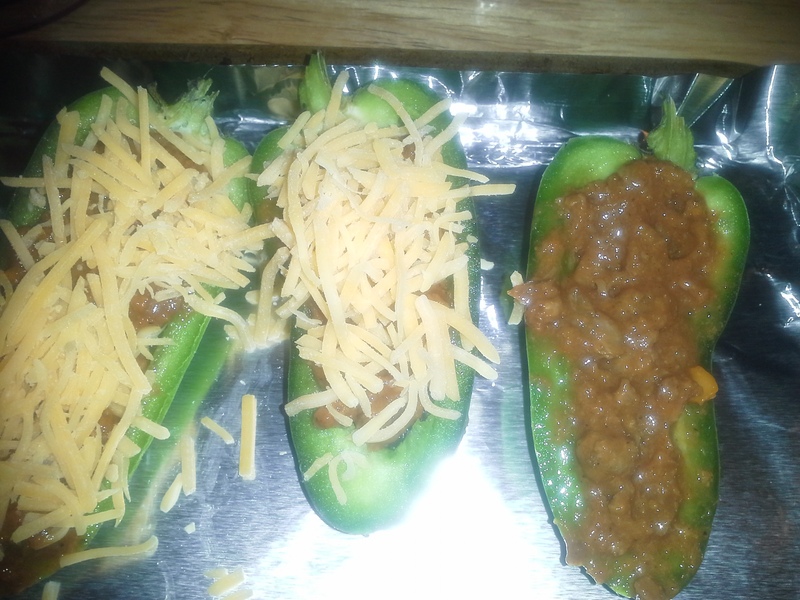 Bake 25-45 minutes—until meat is sizzling and jalapenos are softening (the skin will appear wrinkled) but not mushy. In a small bowl, mash the avocado and stir in salsa to make guacamole. 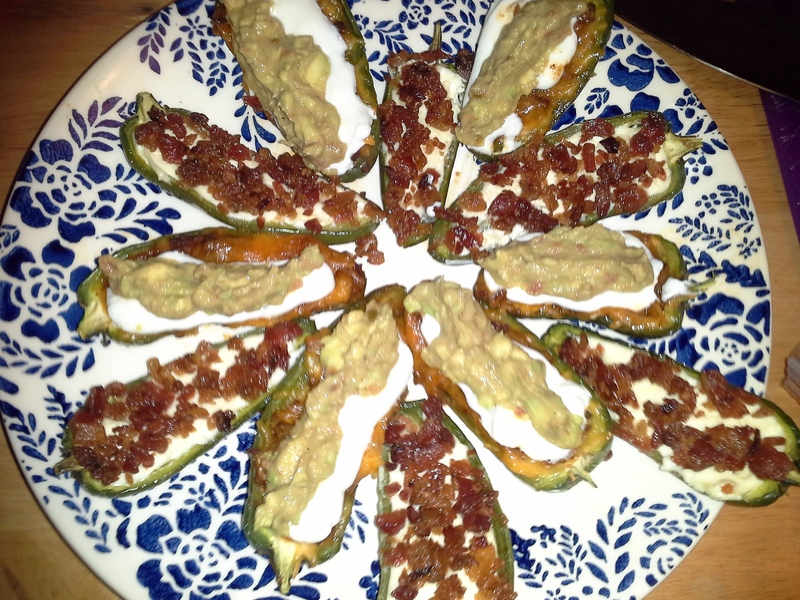 Top each popper with sour cream and guacamole. Serve hot. ***If I make these again, I will put the cheese in first. The length of time it took these to cook until the peppers were done made the cheese crusty rather than melty. Or you could add the grated cheese just before they are done. Depends on if the cheese is for looks or taste (or both.) These look delicious, though. Think I’ll make some soon. I love making these but I needed more flavor in the cheese. I added a tbsp of minced onion, 1/2 tsp of garlic powder and 1/8 c of shredded cheddar To the cream cheese. I just stuffed a similar mixture to that in some chicken breasts, with chopped jalapeños mixed in — and then wrapped the breasts in bacon. So I’ll definitely be trying these additions to the poppers. Thanks for the tip!